The Perseid meteor shower peaks tonight (Aug. 12, 2015). Astrophotographer Maxwell Palau took this image of the Perseid meteor shower from Mount Palomar, near San Diego, on Aug. 13, 2014. For many skywatchers across the United States, clear skies and a dark moon will create optimal viewing conditions for tonight's Perseid meteor shower. "The skies will be clear for an unusually large section of the U.S.," said Jeff Masters, meteorology director of Weather Underground, of tonight's (Aug. 12) weather forecast. 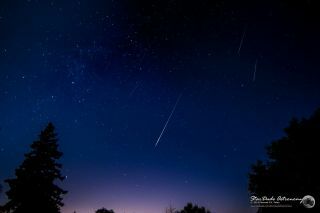 You can also watch a live webcast of the meteor shower courtesy of NASA TV starting at 10 p.m. EDT (0200 GMT). The most favorable viewing conditions for the Perseids will be for a large portion of the eastern half of the United States, as a large high-pressure system will be in control. "Similar conditions will be found for many of the West Coast states," said Andrew Mussoline, a meteorologist for AccuWeather. But not every part of the country will see perfectly clear skies. Along the Gulf Coast eastward, to northern and central Florida, a stationary weather front will bring a swath of clouds, as well as a few showers and thunderstorms. "The poorest viewing conditions will be found across central Florida, as plenty of clouds will block the view for many," Mussoline said. An upper-level weather disturbance also could deliver clouds and a few showers and thunderstorms to parts of Minnesota, Wisconsin and Michigan. However, these areas will have sufficient breaks in the clouds, giving stargazers the opportunity to see some Perseids during times of clearer skies. And finally, a couple of hit-or-miss showers and thunderstorms might fall over eastern sections of Wyoming and western South Dakota. But for much of the rest of the country, the weather should not be a problem for viewing tonight's Perseid display. Another factor that makes the Perseids popular is that the temperatures this time of the year are comfortable — 50 to 70 degrees Fahrenheit (10 to 21 degrees Celsius) across the northern and central states and a balmy 70 to 80 F (21 to 27 C) in the South. The latest forecast for your local area can be found here: http://www.nws.noaa.gov/organization.php. That page also provides links to all of the National Weather Service Forecast Offices around the country. Just select your region to get information from the office that serves your area. Look for the Perseid meteor shower coming from the constellation Perseus in the northeastern sky on the night of Aug. 12, 2015. The Perseids appear to radiate out from a point on the border of constellations Perseus and Cassiopeia. The bright streaks of light seen during the Perseid meteor shower are bits of debris from a comet. The Perseids are white or yellowish, numerous and bright, with some fireballs (extremely bright meteors) and glowing trains (trails of excited air molecules left behind by bright meteors). At the shower's peak tonight, these meteors will appear to diverge from a small area in the northern part of the constellation Perseus (hence the name "Perseid"). This location is so far north that it's above the horizon for most skywatchers in the U.S. when darkness falls. Therefore, stargazers might see a Perseid or two during the evening hours. But the numbers really begin to increase after midnight. That's when the meteors will fall at the one-per-minute rate that makes this shower so exciting. To stay awake for the late-night event, I have always found that it helps to have had a late-afternoon nap and a shower, and to wear fresh clothing. Expect the temperature to be below what your local forecast suggests. When you sit quite still, close to the rapidly cooling ground, and the air is damp, you can become very chilled. Long lawn chairs, heavy blankets, sleeping bags, ground cloths, auto cushions and pillows are essential equipment. Some food or drink will also help keep you comfortable. Good luck, and enjoy the show! Editor's note: If you capture a great photo of the Perseid meteor shower and want to share it for a possible story or gallery, send images and comments in to managing editor Tariq Malik at spacephotos@space.com.